The Hill Country is a roosting place for Mexican free-tail bats. While many folks are scared of bats, they are intriguing and marvelous creatures who we can observer and learn from. They serve as voracious insect eaters, and donate their guano (excrement) for multiple uses in our advanced society (cosmetics, fertilizers, explosives). Watching bats depart their cave at the appointed time (dusk) is a sight to behold. It is an amazing phenomenon at sundown when they begin to come out, a few at first then more and more until they become a swirling mass which some describe as being like a black tornado. Watching them return at dawn is the second big thrill. These are maternity caves where the bats return each spring to mate & give birth to their pups. 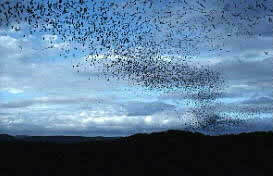 Unfortunately the bats fly south for the winter & are only here from mid-March through September. Learn more about our bats and how to enjoy them in a park setting. See our background information and bat cave information below. Note, many of these caves are part of the Texas Parks & Wildlife system and are profiled, along with all other State parks in the Hill Country, in more detail at Parks & Lakes. 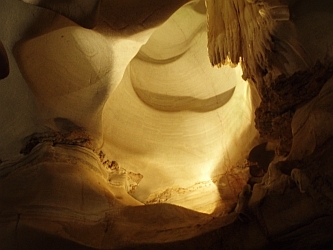 Also see our related Portal profile for Caves & Caverns. Handbook On Texas: "Order Chiroptera. Four families of bats are represented in Texas: Mormoopidae (mustached bats and allies), Phyllostomidae (leaf-nosed bats and allies), Vespertilionidae (common bats), and Molossidae (free-tailed bats). A single species of Mormoopidae, the ghost-faced bat (Mormoops), occurs in Texas and is known as far north as the southwestern and south central regions of the state. Members of the family Phyllostomidae are limited primarily to the American tropics. Three species barely reach Texas. The Mexican long-tongued bat (Choeronycteris) has been recorded once in the lower Rio Grande valley, the big long-nosed bat (Leptonycteris) is known in the Big Bend, and the hairy-legged vampire (Diphylla) has been taken but once from near Comstock. Twenty-two members of the family Vespertilionidae make up an important component of the Texas fauna. All are insectivorous. Some, such as the big brown bat (Eptesicus), are nearly statewide in distribution. Others, such as several species of the genus Myotis, have more restricted distributions. And some, such as the silver-haired bat (Lasionycteris), may be present in the state only during semiannual migrations. Four species of the free-tailed bats or Molossidae-three in the genus Tadarida and one in the genus Eumops-occur in Texas. Only one, the Brazilian free-tailed bat (T. brasiliensis), can be distributed statewide, and only in the warm months." TPWD: Video on bats and bat caves in Texas. From the Devils Sinkhole Society web site: "The Mexican Free-Tailed Bat (Tadarida Brasiliensis mexicana) is a subspecies of the Brazilian Free-Tailed Bat (Tadarida brasilensis). The bat is called free-tailed because the last part of the tail is not enveloped in the back membrane as are most bats. This gives all free-tailed bats a distinctive short mouse-like tail. Bats are mammals but otherwise not related to the mouse. As mammals all bats are born live, attached to a placenta, just like the rest of us mammals. The pups suckle from the breast and are helpless. The adult Mexican Free-Tailed Bat is about four inches long and weighs only about fifteen grams (about half an ounce). The pup is the size of the end of your little finger. In the summer this bat can be seen in Texas living in colonies of millions in caves and man-made structures such as bridges. The bats emerge each evening from the Sinkhole and fly to the agricultural areas to the east and southeast where they feast on insect pests, mostly moths. The bats of the Devil's Sinkhole have a unique problem. The huge cavern has a relatively small opening in the dome. Flying straight up is difficult so the bats circle upwards in a counter clockwise direction. This swirling bats become squeezed into a small spinning column as they emerge from the opening. To the onlooker it is like a dark tornado that lasts about 45 minutes." Located in NW Blanco County, RR 3347 (Althaus-Davis Rd) at intersection of A Davis Ranch Rd, a ghost town settlement along Comanche Creek near Comanche Spring, NE of Willow City, and 15 mi NW of Johnson City. See history at TSHA, Profile2, JC Record-2011. Lat: 30.44694; Long: -98.57722. Elevation: 1271. Map. Location nearby of Blowout Cave, with a resident bat population, and the source of the community name. The cave is on a private ranch. Seasonal home to a colony of 1-4 million Mexican Free-tailed bats. 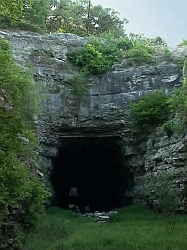 Tours are available to view the unique collapsed cavern called the Devil's Sinkhole. 1860-acre area at 2,450 ft elevation. The main attraction is the sinkhole itself and the bat population. It is a vertical cavern with an opening measuring approximately 40x60 feet and a vertical drop to the main cavern of about 140 feet and a total depth of 350-400 feet. The main cavern is circular and reaches a total depth of 350-400 feet. The Devil's Sinkhole Society now offers Evening Bat Flight tours throughout the summer and Guided Nature hikes on the first and third Saturdays of every month except during hunting season. Day tours can be arranged with a minimum of 3 days notice. Reservations are required. There are picnic sites and some trail development. No camping. Texas' largest one-chamber cave and 4th deepest cave. Wildlife preserve. 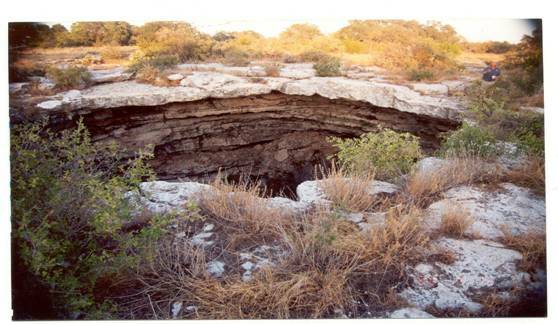 Access to the park can be obtained only by contacting http://tpwd.texas.gov/state-parks/devils-sinkhole, 830-683-BATS (2287) to reserve a tour. Tours (May-Oct) meet at Visitors Center in Rocksprings at 101 N Sweeten St. Other available tours include birding, nature walks, motorcycle and day tours. One of the largest bat nurseries in the country. About 1.6 permanent million female bats inhabit the site from May through September. Most of these are pregnant when they arrive. In the Bat Cave, females each give birth to a single pup in June or July. The young bats grow rapidly and are able to fly at about five weeks of age. However, they will remain with their mothers until they return to Mexico in October. 10-12 million Mexican free-tailed bats ascend at dusk and return at dawn at this privately owned cave. This is alleged to be the 2nd largest bat population in the world and the largest is open to the public. You may see Cave Swallow, Rock & Canyon Wren, & maybe a Ringed-tail cat or Skunk entering the cave to catch dinner. Be amazed as several species of Raptor dive into the exiting swirl of Bats. This is a maternity cave where the bats return each spring to mate & give birth to their pups. Unfortunately the Bats fly south for the winter & are only here from mid-March thru September. The bat guano was mined during the Civil War for Confederate black powder. The rocked furnace pipe used in drying the guano can be seen at the cave entrance. This huge cave once was a favorite roosting cave for bats. Now, there are only about a dozen Eastern Pipistrelle bats in Longhorn Cavern. They do not hang out together, they are loners. Cave staff now report they get to see one every now and then during the winter months when the bats are hibernating. For more information on the bats that live inside Longhorn Cavern, visit their Gift Shop and request a book named "Hey! I've Got Feelings Too!". Longhorn Cavern State Park is a 646 acre scenic park, featuring Longhorn Cavern, formed in prehistoric times by water flow. Activities include hiking; a 1.5 hour cave tour covering 1.25 miles of caves; and a geology program. Facilities include a gift shop, a full service deli and snack counter, gift shop, a picnic area, and 2 mi of hiking trails. Open for day-use only. Elevation is 779 to 1585 feet. Admission fee for cave tours. Location: In Burnet County, in Burnet, TX 78611; 6 mi W of Hwy 281, on Park Road 4. In 1918, Albert Steves erected a "Hygieostatic" bat roost on his family farm in Comfort. This roost was built to attract bats in an effort to control mosquito populations by natural means. The current population is a mix of about 1,000 Cave myotis (Myotis velifer) and Mexican free-tailed bats (Tadarida brasiliensis), though at one time there may have been as many as 10,000. It was originally researched and developed by Dr. Charles Agustus Rosenheimer Campbell of San Antonio. The idea was to use bats against malaria carrying mosquitos. At one time, there were sixteen bat roosts built in the United States and Europe, of which only two sites now remain - one in Comfort and one in the Florida Keys." History & Details. Location: On the banks of the Guadalupe River in Comfort at the private residence of Marshall Steve, the third generation of the family to grow up with a famous bat roost in the backyard. At 29.9704,-98.8849, off FM 473 east of town. Cited in the National Register of Historic Places on March 28, 1983. BRACKEN CAVE & NATURE RESERVE: San Antonio, TX. Owned by BCI (see below). One of the world's largest bat colonies, home to some 20 million Mexican free-tailed bats. This location is a maternity colony where the mother bats raise their bat pups every year. The colony is located on a 687 acre ranch and is home to many bird species. Access is available only to BCI members (see web site below). Location: In the NE outer section of San Antonio near Garden Ridge, and SW of New Braunfels, in Comal County off IH-35. CLARITY TUNNEL: Located at Caprock Canyons State Park and Trailway in the Texas Panhandle. 806-455-2240. CONGRESS AVENUE BRIDGE: Austin, TX. Owned by the City of Austin, and located in the heart of downtown, this bridge hosts one of the largest bat colonies in the world, with an estimated 12.5 million Mexican free-tailed bats. This location is a maternity colony where the mother bats raise some 3/4 million bat pups every year. The roosting began in the early 1980's after the bridge was renovated. It is now a major tourist attraction for Austin. There is a special bat viewing area, called the Austin-American Statesman's Bat Observation Area. There are education kiosks and bat educators from Bat Conservation International on weekend nights in the summer and is free. Good views are also available from atop the bride, which also is free. Boat bat tours are available (Lone Star: 512-327-1388, www.lonestarriverboat.com; and Capital Cruises: 512-480-9264, www.capitalcruises.com]. Bat Hotline: 512-416-5700, category 3636 for info and current bat emergence times. NEY'S CAVE: Hondo, TX. Claimed to be one of the largest bat habitats in the world, was used in the manufacture of gun powder during the Civil War. BAT CONSERVATION INTERNATIONAL (BCI): 512-327-9721; www.batcon.org. A membership based organization. FACT: Austin & the Hill Country have bats and San Juan has their Capistranos, but did you know that Jonestown TX has it's own unique birding experience? They're called the Chimney Swifts of Jonestown and every evening they put on a spectacular show as they drop into their home in a swirling almost tornado-like spectacle. It is really something to see. Annual celebration & sighting: SwiftFest in Sep in Jonestown at City Hall Plaza, 3p-8p. with live music, an art show, exciting nature-oriented booths and more. 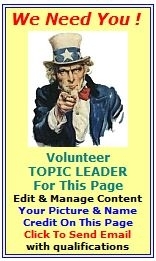 Contact: Lago Vista/Jonestown Chamber, 512-267-7952, www.lagovista.org.